Spread over 10 trading platforms and 200+ tradable instruments in Forex, shares, spot metals, futures, commodities, and spot indices, IronFX is an award-winning international leader in the competitive realm of online trading. The company serves institutional and retail investors in more than 180 countries in the Middle East, Europe, Africa, Asia, and Latin America. Providing superb customer service in more than 45 languages from 8 offices around the globe, customers of IronFX can derive a great advantage from a round-the-clock service that is delivered by one of world’s most accomplished and skilled teams for client coverage. The client-centric model of the forex enterprise unites a tailored trading functionality offered across its platforms with the broadest set of products in an effort to deliver the best execution, pricing and liquidity. Insightful research and daily news feed of the trading markets provide the firm’s traders with an access to the best data and information to make informed decisions in regards to trading. To further strengthen its global leadership, the IronFX Group has recently declared its official partnership with FC Barcelona, one of world’s most successful and professional football clubs. The corporation is stringently overseen by three of the largest regulatory entities – U.K.’s FCA (No. 585561), Cyprus’ CySEC (No. 125/10), and Australia’s ASIC (AFSL 417482). Three (3) live accounts can be found on IronFX’s website. The live accounts can be both with fixed or with floating spreads. The Micro account at IronFX’s minimum deposit is $100. Its base currencies are USD, AUD, GBP, JPY, CHF, PLN, EUR, HUF, RUB, and CZK. The account’s maximum leverage can be up to 500:1. The minimum lot size and the lot increments are both set to 0.01. The spread on EUR/USD for the Micro account is as low as 1.1. The Premium account is characterised by a minimum deposit of $2,500 and a maximum leverage going up to 500:1. Its base currencies are the same as those of the Micro account –USD, AUD, GBP, JPY, CHF, PLN, EUR, HUF, RUB, and CZK. The lot increments are 0.01 but the minimum lot size for this account is 0.1. The EUR/USD spread for the Premium account is 0.7. To launch your competitive trades via a VIP account, a minimum deposit sum of $20,000 is necessitated. The account’s maximum leverage is as high as 500:1, but this account can only be initiated in USD. The minimum lot size for the VIP account is 0.1 while the lot increments are 0.01. VIP’s spread on EUR/USD can be as low as 0.5. Additionally, there is an STP/ECN account, which benefits from zero spreads, max leverage of 200:1, min trade size of 0.01, and $500 minimum deposit required to incept it. All accounts derive benefit from zero commissions, technical analysis reports, dedicated account managers, complete network-operating environment support, and a real-time customer coverage. The trading platforms of IronFX have been crafted to facilitate trading experience that is not only practical but also efficient and powerful. Custom-made technologies enable its customers to trade with re-quotes, precision, and without slippage. World’s most renowned trading platform – MT4 – at the forex enterprise possesses a potent pack of more than 10 versions for PC/MAC, tablets, and mobile trading. The MT4 Standard revolves around advanced charting, activity reports, live monitoring of the prices of financial instruments, online streaming news, as well as positions, orders, exposure, and equity online management. Its cousin – the MT4 Advanced – is additionally empowered by built-in ability to use EAs and automated strategies. The MT4 for mobile and tablet trading receives also the chance to trade directly from charts and have an entire account control. The MT4 Multiterminal enables investors to have multiple account management and executions as well as multiple order types thanks to advanced charting, activity reports, and live monitoring of the prices of financial instruments. While all other platforms require downloads, IronFX’s WebTrader is 100% web-based. Traders can even access the web terminal without having the need to register on the MQL5.community. The WebTrader is a contemporary HTML5 application that needs no additional browser add-ons or plug-ins and is securely encrypted, guaranteeing a safe trading atmosphere. Barclays, Westpac, Unicredit, Santander, and BNP Paribas are some of IronFX Group’s treasury and banking partners. These reputable banking entities are entirely independent and under no circumstances endorse obligations on customers of the forex corporation. To make drinking of beer after a hard trading day even more palatable for clients of IronFX, it segregates their accounts from its own funds and, as mentioned from the outset, the company abides by the most stringent stipulations and regulations of CySEC, FCA, MiFID, and ASIC. The enterprise is also a part of the Investor Compensation Fund – now that’s an excellent security, don’t you think? When it comes to customer services, IronFX not only does have 8 worldwide locations but it is also happy to deal with any challenge investors may encounter while trading. Getting in touch with the support centre is done via a live help, several phone lines and e-mails, as well as through the “Call Back” option. The firm’s website is very elegant and is accessible in English, Czech, German, Arabic, French, Chinese, Spanish, Japanese, Italian, Korean, Portuguese, Polish, Russian, and Slovak. For IronFX, the security of client funds is of paramount importance for the philosophy of the group. For this reason, the company has crafted in-house a tailored interface to allow hassle-free and easy account funding making use of the trailblazing Client Portal. Through this portal, deposits and withdrawals are 100% automatic. Bear in mind that the enterprise does not take cash deposits. Along with VISA and MasterCard, depositing at IronFX also encompasses Bank Wires, Skrill, NETELLER, DotPay, China UnionPay, Safecharge, FasaPay, and M.O.T.O. Only NETELLER necessitates a 2% (capped at $30) deposit fee. The options for withdrawing are exactly the same and fees vary from 0.5% to 1% (capped at $10) depending on the method. 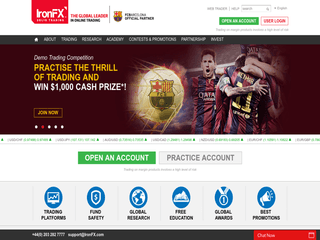 IronFX’s website is literally teeming with various promotions as well as forex contests. At the moment of this review, both the live and demo contests were closed, but they usually are held several times a year. The firm pampers its avid clients with trading bonuses than can be either a 100% sharing bonus (up to $10,000) or a 40% power bonus that is up to $4,000. Additionally, there is a cash rebate bonus, which is calculated in this way: 1) from 1 to 199 lots – $2 per lot; 2) from 200 to 499 lots – $2.5 per lot; and 3) Over 500 lots – $3 per lot. IronFX also offers the following perks: VPS hosting, Reward Point Scheme, IronFX Card, as well as the “Refer a friend” option which yields between $50 and $200 depending on the amount your friend deposits (min $200 for $50).